You should visualize how the boat steers and is powered before attempting any repairs. 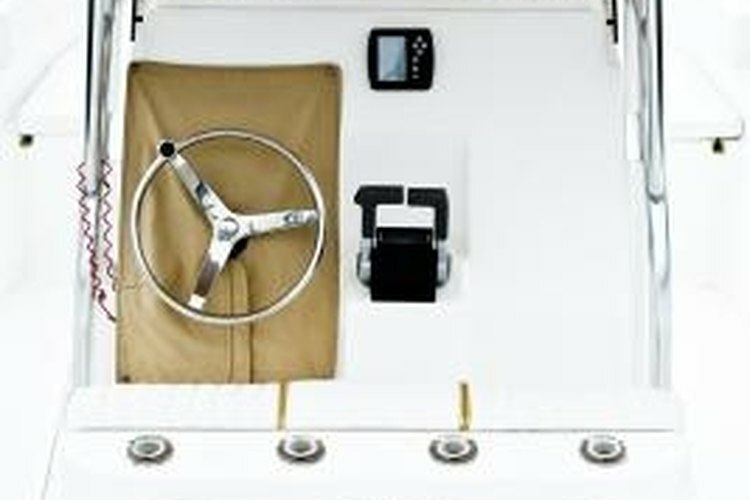 The MerCruiser throttle cable attaches to a kill switch to help the gears shift from forward to reverse. There is no neutral gear, so the kill switch serves this purpose. A novice may think the sound of the killed engine is a sign the throttle isn't working properly, which is not correct. When shifting from forward to reverse, the gears lock. You can feel the resistance in the shift handle of the gears not sliding by each other. By killing the engine, the gears let go and shift, and the engine starts up again. Pop off the shift lever's plastic housing with a flathead screwdriver. Trace the shift cable from the shift lever to the propeller on the MerCruiser. A shift arm, the lower shift cable that attaches to the shift arm, the propeller, some metal studs and slots for the cable to rest in when shifting from forward to reverse now are exposed. Detach the forward shift cable from the shift arm. Remove the clip by pulling on it. Move the shift lever to forward gear with your hand. As you shift, feel the movement of the gear shifting into forward. You want a smooth forward movement and then a definitive locking sensation when the shift lever reaches its position. Push the shift lever into the forward gear and keep it there. Forward gear is the shortest throttle cable position. As you push the lever into forward gear, the propeller needs to be rotated counterclockwise. Have someone rotate the propeller. Adjust the forward cable barrel while the throttle cable is in the full forward position. Adjust the cable so it fits snugly between the studs, which are pre-mounted and hold the shift cable in position. If there is slack in the cable, then you need to make another adjustment. If the cable is too tight, then the lever is unseated off the roller in the shift assembly. This is the forward adjustment. Shift the lever into reverse. Disconnect the lower cable from the stud at the end of the cable. Grab the end of the lower cable where you just removed it from the stud and pull. While pulling, turn the propeller clockwise. The throttle now is in full reverse position. Move the lower cable up and down until it fits in the slot between the studs. Do not shorten the lower cable to fit the in the slot. Create some play in the cable until it securely fits in the slot. This is the rear adjustment. When adjusting a throttle cable, there needs to be a 6-inch pre-set give in it so that it fits into the slot without shortening or lengthening. Disconnect the battery cables from the MerCruiser to prevent an accident or injury.